TrafficSmart USA 3 – View Smart Routes & Beat Traffic! TrafficSmart USA turns your iPhone into the smart traffic solution of next generation with innovative features that no other apps have ever offered before. It adopts pioneering methods that enable you to easily figure out the most up-to-date traffic conditions of major roads and streets, highways, and freeways in over 100 cities and 30 states, for a total of 10,000+ traffic cameras nationwide. Whether you are at home or on the road, you can take a quick look at the live traffic and decide what route is best for you. TrafficSmart USA remembers routes that you create, thus helping you keep track of traffic conditions rapidly. You can create multiple routes, such as commute from home to work, or long distance from city to city - all at your fingertip. Creating your route is simple and easy. Just edit your routes map, click and add cameras. That's it! 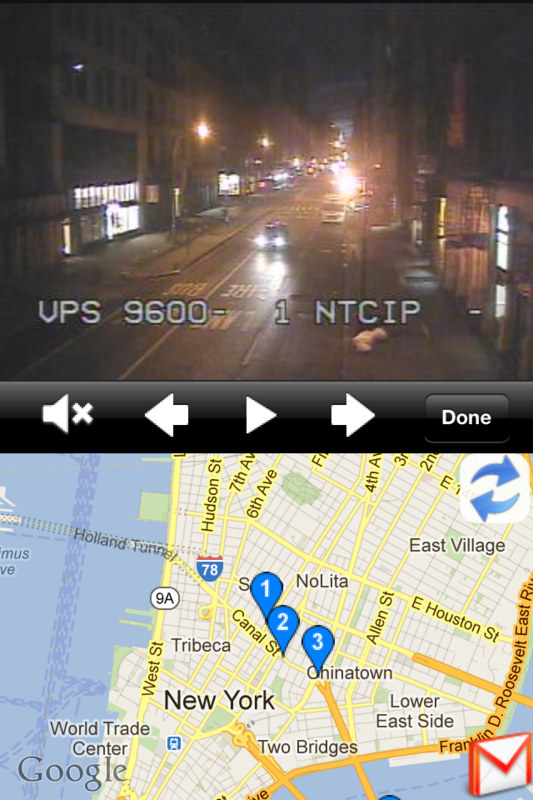 Slideshow allows you to go over the cameras on each of your routes. You can quickly "flip through" the cameras by hand, but you can also view the slideshow in auto mode so that you can sit back and relax. While images are updated automatically, there are over 5,000 cameras (green pins on maps) nationwide that offer faster-updating videos (new frame every 2 to 5 seconds). Traffic Flow allows you to see the speed of traffic (from slow to fast) for major roads in the United States. ✔ “Edit Route” for you to add, delete or reorder cameras on a route. 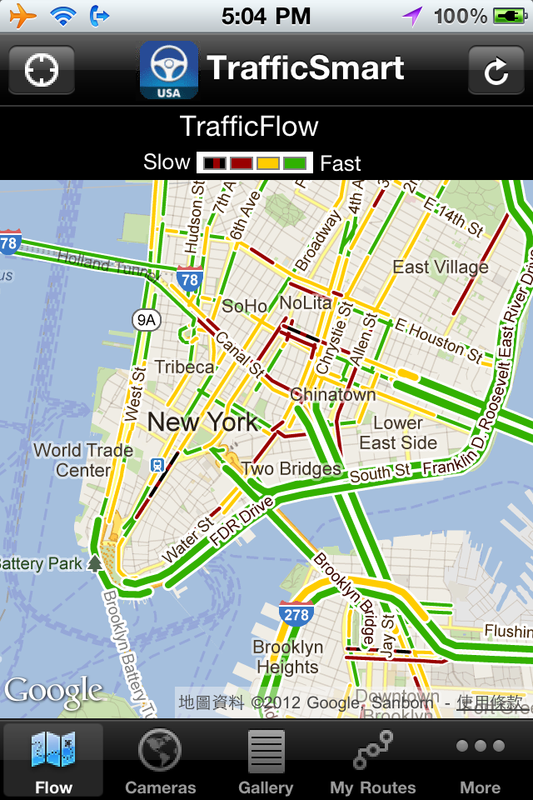 TrafficFlow is supported for all major roads and streets in all states in the United States. TrafficSmart cameras are located in and near over 100 US metropolitan areas, including: Atlanta, Baltimore, Boise, Boston, Buffalo, Charlotte, Chicago, Cincinnati, Colorado Springs, Columbus, Dallas, Daytona Beach, Denver, Detroit, Fort Lauderdale, Greenville, Hampton Roads, Hartford, Indianapolis, Jacksonville, Kansas City, Las Vegas, Long Island, Los Angeles, Louisville, Memphis, Miami, Milwaukee, Minneapolis, Nashville, New Haven, New Orleans, New York City, Newark, Ogden, Orlando, Philadelphia, Phoenix, Pittsburgh, Portland, Provo, Raleigh, Riverside, Rochester, Sacramento, Salt Lake City, San Francisco, Seattle, St Louis, Tampa, & Washington DC. States NOT SUPPORTED YET by TrafficSmart cameras: Alabama, Alaska, Arkansas, Hawaii, Maine, Mississippi, Montana, Nebraska, New Hampshire, New Mexico, North Dakota, Oklahoma, Rhode Island, South Dakota, Vermont, & West Virginia.